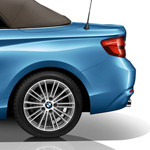 The BMW 2 Series is the ultimate in fun and luxury. This popular vehicle is offered as a coupe or a convertible. The choice is yours to make! The 2 Series enthusiasts at Thompson BMW in Doylestown are on hand to answer any questions you have about this venerable premium vehicle. The power of a BMW 2 Series cannot be denied. Despite its small and sporty size, this vehicle delivers what you need when you need it. The xDrive Coupe boasts 335 horsepower and goes from 0 to 60 mph in as little as 4.2 seconds. 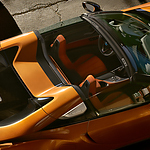 The BMW i8 is a welcome addition to the EV market. It expands the possibilities of what cars can achieve when using advanced technology, and we're proud to carry it at Thompson BMW in Doylestown. The BMW X3 is a powerful compact SUV that has been rated among the highest luxury compact SUVs in its class. You'll find that the 2019 BMW has been completely redesigned with sharper headlamps, sportier fog lamps, and an aerodynamic body style. However, it's the interior that's truly impressive. Inside, there is comfortable seating for 5 as well as tons of cargo room, which has received from drivers and critics. 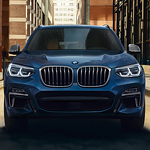 The 2019 BMW X5 comes in two distinct trims, and these include the 40I model and the 50I model. Both trim levels offer turbocharged motors, but the 50I model provides extra power in the form of a V-8 motor that provides over 450 hp. Both models also offer durable transmission components such as all-wheel-drive service and locking rear wheel differentials. 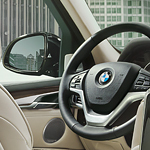 In addition, the BMW X5 trims provide drivers and passengers with the comfort of optional air suspension systems. These air activated suspensions are adjustable depending on road conditions. 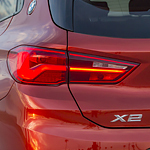 One of the most popular luxury subcompact sports activity vehicles (SAV) on the road today is the BMW X1. Its countless features have drivers coming back year after year to see the updates that BMW engineers have come up with. That is why we here at Thompson BMW located right in Doylestown are so excited to tell you all about the 2019 model! This SAV comes in ten different colors which means you'll be able to pick the one that fits your personal style the best. Additionally, this vehicle includes top notch performance features. There are tons of reasons that people choose vehicles ranging from convenience to style. However, it is okay to choose a vehicle because of your need for thrills. 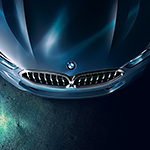 The 2019 BMW 8 Series Coupe is the series of vehicles that are designed to provide you with a thrilling driving experience. Drivers choose to purchase BMW cars because of their top of the line performance in addition to the luxury features that allow you to drive in style whether you are commuting to work or just running a few errands. 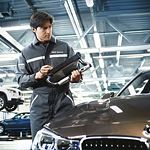 Because of this, they want to be sure that BMW's service and maintenance programs are just as good. That is why we here at Thompson BMW located in Doylestown want to tell you all about the service and maintenance plans for BMW. One of the best things about these plans is that they provide fully certified BMW tires. Are you searching for a luxury vehicle that feels like it was designed just for someone like you? The BMW 7 Series is the flag-ship luxury performance car from BMW and you will find that this car will deliver all that you are seeking. Luxury SUVs have quickly become an increasingly popular choice for car buyers. And when talking about luxury SUVs, no one can ever leave BMW models out of the conversation. 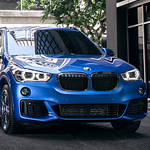 That is why our team of SUV experts at Thompson BMW located right here in Doylestown are so excited about the all new BMW X Models!